I love running on my treadmill. Not nearly as much as running outdoors and exploring a new place to run or running a familiar path. The scenery and smells of running in different places is something I really love about running and also just travel in general. But there are times when I turn to my treadmill, it is and old friend that I can always count on. A lot of runners don’t like treadmill running because its boring, time on the dreadmill seems to take longer and nothing changes. I agree, treadmill running can be boring and that’s why most of my running is outdoors. I first bought a treadmill 4-5 years ago when I was a single father, I have 50% shared parenting of my daughter and my week with her was busy and didn’t allow me to get out of the house and run. So I bought a treadmill and ran in the morning before she woke or at night after she went to sleep. Every second week all my running was on a treadmill or I wouldn’t be running at all every second week. Fast forward a few years and I am in a great relationship now and my daughter is older and I don’t rely on the treadmill as much but I still turn to it regularly. I’m not a huge lover of running in the rain, I may be in the minority because I know lots of running friends that love running in the rain. but when it is heavy rain or cold rain I turn to my treadmill. 2) The Pace is Consistent. 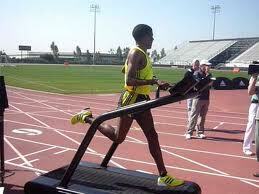 I use my treadmill sometimes for intervals training. The pace and incline is always accurate, you can set interval session up and let the treadmill go to work and just concentrate on keeping pace. You always know that you’ve worked as hard as you should have. You have full control over the pace and incline you are running. One of the ways I keep treadmill running interesting is mixing up the workouts, sometimes its intervals, or hill repeats, or a I’ll ramp up the speed and incline at a regular set time interval or just run easy. There are unlimited options to keep your running fresh. Running is hard and as runners we push ourselves out of our comfort zones all the time. Sometimes its nice to take a shortcut. The belt running through makes running easier than running on the road. Nothing wrong with a shortcut occasionally. Sometimes I set the TV up in front of the treadmill and watch the footy on the treadmill. I would recommend doing this for intervals but for an easy longer run it’s keeps your treadmill time from being boring. Doesn’t have to be footy either anything you enjoy is fine. I first got a treadmill our of necessity and I did find it boring, experimenting with different types of runs that I enjoyed help me love my treadmill. Plus if it’s good enough for Haile Gebrselassie it’s good enough for me. This entry was posted in Running and tagged running, treadmill. Bookmark the permalink. I like the treadmill, and actually don’t find it easier than running outside. Although I know a lot of people think that, so I guess I’m weird like that. Totally agree on the intervals and with getting your workout right. The highest point where i live is about 10m above sea level, so it´s good for hill training too. Not sure about the long runs though, they are killer on the treadmill!